Need a seriously easy summer activity? This one’s the best! I must not be an ice lover. Maybe that’s why my ice machine is always jamming and clogged up and I’m constantly having to dump it and start over. What a waste of ice, right? Wrong. 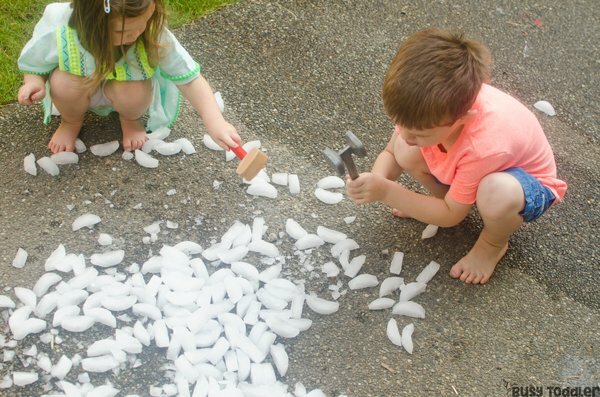 Because left over ice makes for one awesomely easy summer activity. I’m actually obsessed with ice cube activities! I might not use the stuff in my beverages, but I’m an ice maniac. 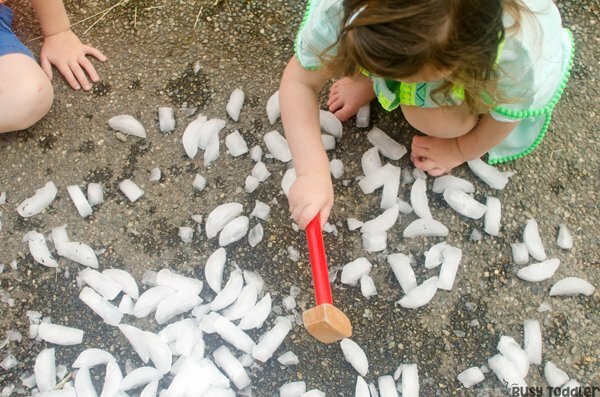 Sometimes we paint ice, sometimes we make it rainbow colors, and sometimes we just use it in a sensory bin because ice is fantastic for toddlers and preschoolers. 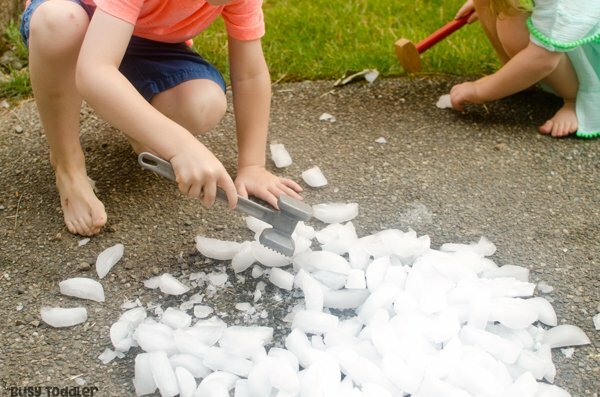 Heck, I even have a whole summer camp week dedicated to ice cubes! Of course, please use good judgment and loads of supervision with children and ice cubes. 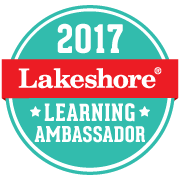 There’s so much you can learn from that little block of solid water – and I’m happy to squeeze every drop of learning juice out of them. 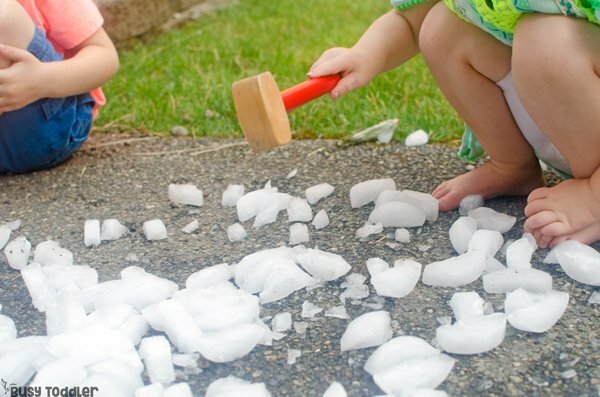 One of my FAVORITE versions of this activity is from The OT Toolbox – most colorful ice you’ve ever seen! Basically, this is the easiest set up ever. Again, please use good judgment and loads of supervision with children and hammers. Jeesh – a lot of disclaimers today! This is one of my favorite easy summer activities because, well, it’s just that easy. I take the whole bin of ice and dump it on the patio. Obviously, a shaded spot is better – you’ll get more play time with the ice the farther away it is from direct sunlight. I give my kids (ages 2.5 and 4) hammers and meat mallets and let them have at it. They could do this for ever! They love smashing those cubes into tiny pieces. I’m not going lie: it’s pretty fun so make sure you get a few whacks in too. It’s actually a really valuable activity too. This might look like the world’s easiest activity, but it’s also a valuable one too. 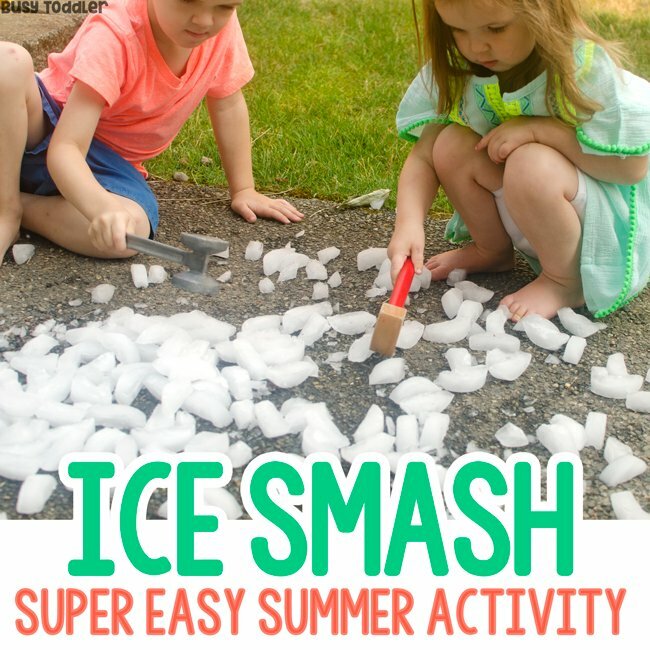 It seems like such an easy summer activity – and it is! But it’s also one that has a whole lot to it. 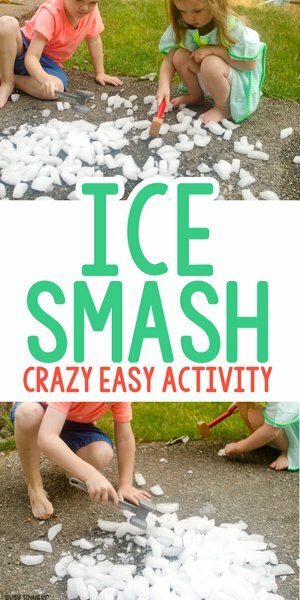 Ice smash will always be one of my favorite activities! Even though I might not love drinks with ice cubes, that hasn’t stopped my love of activities with them. I can’t get enough. 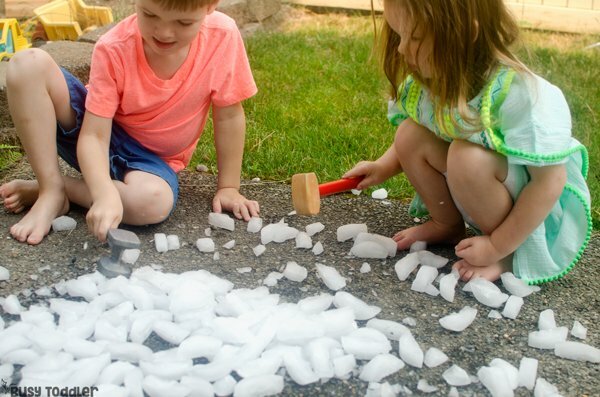 Grab you ice cube maker and dump it out – you’ll be amazed at just how fun this activity is! 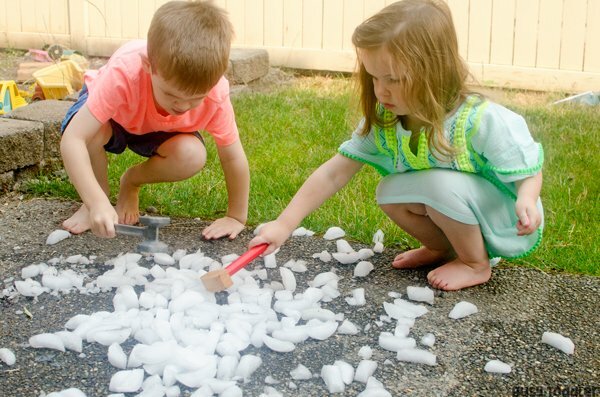 Are you ready to try this easy summer activity? 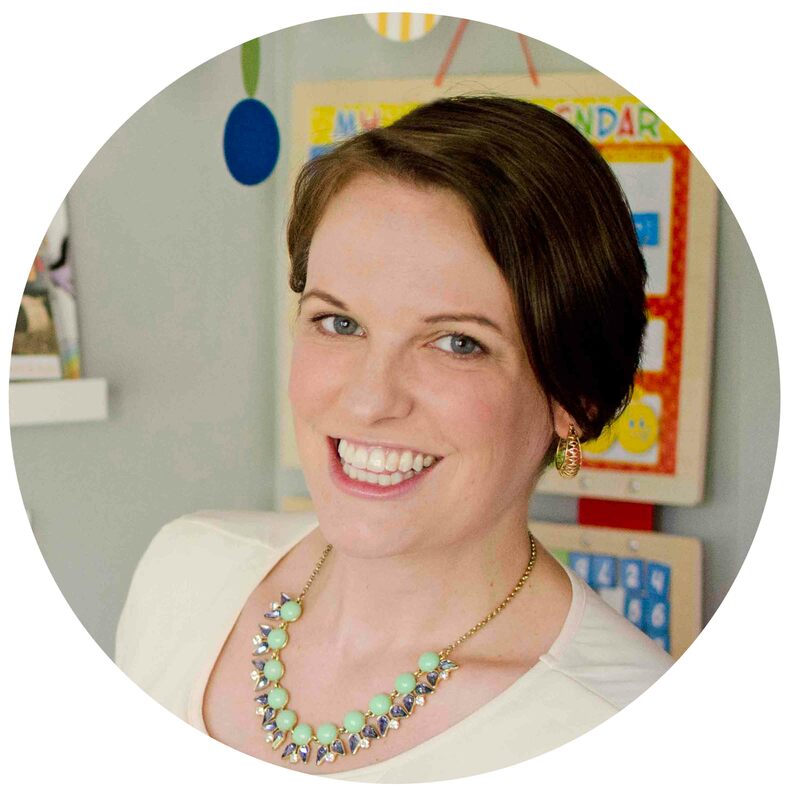 I'm Susie, a former teacher turned stay-at-home-mom. 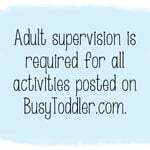 I'm all about fun, simple activities that can be set up in seconds but hold little attention spans for much longer.